The history of the Fellowship in Ethiopia goes back to the early 1970s. Some evangelical through inter-church prayer meetings attempted to bring all churches together in 1970-72. The most significant event considered by many church leaders as the cornerstone for the initiation of the Fellowship of was evangelical churches union conference in 1977. While many agreed that this event laid the foundation towards the Fellowship, the gathering of evangelical constituency during the “Saturday Morning Prayer” has been the most substantial factor towards the strengthening of the Fellowship. The communist regime that came into power in 1974 banned all evangelical practices. This political reality then forced the evangelical church institutions to accept and work towards the establishment of the Fellowship as a necessity of survival. This strong belief in the establishment of an umbrella association was not only concentrated in head offices of the churches, but also to a wide extent to the local churches all over the country. Suffering together for the sake of righteousness and we are living testimony to the crucified Lord. These conditions led to the establishment of an umbrella organization in 1976 by 9 evangelical churches. After the establishment, the Fellowship leaders had to go through a period of imprisonment and torture by the communist state. Even in such situations, they managed to conduct frequent meetings, follow-up and deliver spiritual and physical support and guidance to member church leaders. 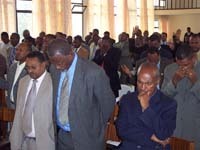 God answered prayer in the removal of the communist regime in Ethiopia in 1991, allowing the preaching of the Gospel and the worship of God to be practiced with official recognition. Just 1 year before the change in government, in 1990, the Evangelical Churches Fellowship conducted its 2nd General Assembly and revised the constitution and established a Secretariat. This decision, coupled with the official recognition, opened up the opportunity for the Fellowship to have its own office. With all these conditions in place, the Fellowship received its official license of recognition to operate as an Association from the Ministry of Justice on 27th of June, 1991. Once the Fellowship was officially recognized, it developed its organizational and functional structure at head office as well as at local levels across the country through its members. The Fellowship has currently a constituency of an estimated 18% (13 million) of the population of Ethiopia. The Fellowship has established a strong link with many partner alliances and is working with government and non-government organizations in different endeavors in various parts of the country.